It doesn’t take a lot of snow to shut down places that aren’t used to snow. The US South goes mad over six inches of snow; New Zealand closes down for ever less. The heartier northern types are used to the cold white stuff, so a little snow doesn’t do a lot for them, but a lot of snow is as bad to them as it is to anyone, and Buffalo, New York is taking a beating. The US record for snowfall in a single 24 hour period is 6 feet, 4 inches of snow, and it looks like upstate New York will be getting close to that. Buffalo, New York, and dozens of other towns are smothered beneath somewhere between 5 and 6 feet of snow, with more on the way. New York Governor Andrew Cuomo has declared 10 counties a disaster area and mobilized the National Guard to assist. Interestate 90, the main east-west interstate in New York, has been officially closed. Some 140 miles of the road are closed, and there are hundreds of cars trapped and stranded. With no real way to get to them, police and rescue officials are conducting searches on ATVs. 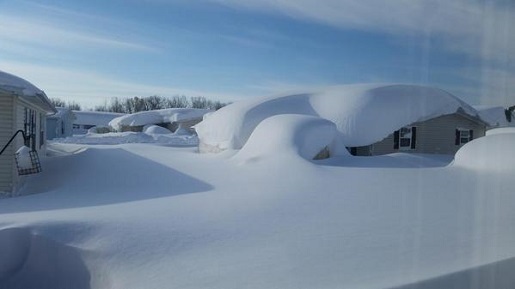 Ambulances cannot reach stranded folks, and houses are covered and buried beneath snow drifts. And it’s not over. There’s a risk of up to 8 inches of snow tonight, plus two more feet of snow on Thursday.